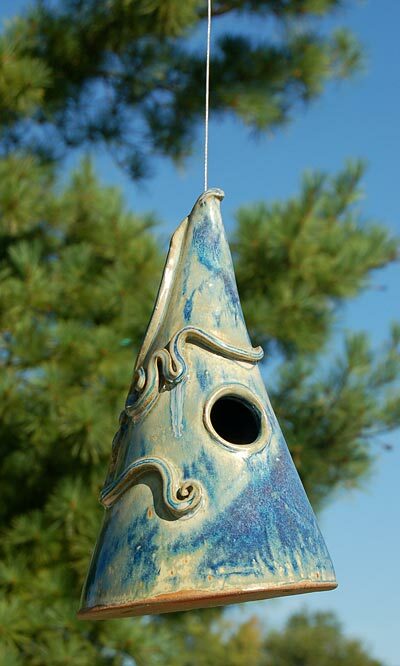 Add functional sculpture and lovely color to your bird sanctuary with this Anthony Stoneware French Blue Cone Hanging Bird House. The extended body, raised curl accents, and ceramic construction form a striking shelter, sure to add excitement and style to your setting. A 1.25" diameter entry hole on the front of this unit allows wrens and chickadees to use it, and the wide base provides plenty of nesting space. Three holes on this base help water drain from the nest, and a rubber plug in the center may be removed for seasonal cleanings. A small, top opening not only accommodates the included hanging cable; it also keeps the home ventilated for the songbirds. The varied, soft blue hues enhance the artistic nature of this hand made item, while its ceramic construction is sure to last for many seasons. The shelter has been fired to 2400° Fahrenheit to ensure durability and resistance to ultraviolet light. Highlight bold geometry in your bird garden with this French Blue Cone Hanging Bird House. Made in the USA.